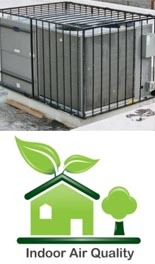 Register's Heating and Air, is a family owned and operated company with over 20 years experience in the HVAC industry. We service the greater Jacksonville tri-county area as well as the surrounding area. We provide quality system installations, service and annual service agreements for both residential and commercial customers. Bothered by allergies from dust, pet dander, pollen or other sources of discomfort? Let us help by recommending an air filtration unit that will help you and your family breathe easier! is critical to the proper operation of your A/C unit. If your system only works well in a couple of rooms, there could be quite a few reasons. A few of these include uneven solar heat load through windows, an undersized system, improper sytem balance and more. Call today so we can arrange for a time to see your home.